Salam Logistics & Supplies has all required in-house resources in terms of technical know-how, engineering manpower, and tools and plants to undertake turnkey projects and contracts of civil, mechanical, and electrical works. Iraqi highway patrol station in Uruk Area, Iraq. Iraqi highway patrol station in Juwairin Area, Iraq. Laundry services project for 10,000 troops in Iraq. 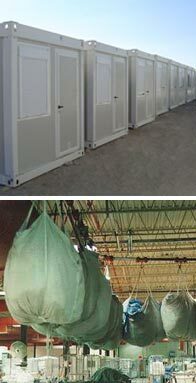 Laundry services project for 15,000 marines in Kuwait. Electrical connections project including power generator cabling in Iraq. Power generation connections for living area of 500 troops in Kuwait. Electrical transforms connection in Falluja, Iraq. Survey project in Baghdad, Iraq. Construction project and material supply in Falluja, Iraq. Power generators synchronizing in Iraq. Grading, Leveling and Gravel supply in Kuwait. Living containers supply for 90 troops in Kuwait. Living containers supply and connection for 120 troops in Iraq. Living containers supply with air-conditioning for 500 troops in Iraq. Base camp project for 10,000 troops in Kuwait. Living containers and shower trailers project in Sudan. Base camp project including life support items for 5,000 troops in Southern Iraq.